Kari Martin is about to get married to her fiancée Frank. The night before her wedding Kari goes out clubbing with her best friends Sicily and Lisa. It turns out that Kari is not the only one who is having a party and she is shocked by what she sees. Heartbroken and devastated Kari calls off the wedding. Needing to build a new life for herself Kari moves to Maine with her friends. She finds a new job as a photographer for the local newspaper and is excited to see what the changes she made will bring her. Jake Isaac left his hometown after his girlfriend betrayed him. Jake loved this girl ever since they were kids and they grew up and became adults together. He is heartbroken and moved to Maine to heal. Jake works as a coach at the local school and also works at the fire department. Jake hasn't seen his parents and brothers in years and he knows that the time has come to go back home. Kari is sent to the school to make pictures of the teacher of the year. When Kari meets Jake she can't take her eyes off him. He is the most beautiful man she has ever seen. Jake is struck by Kari's beauty and even though he is scared to death, because of the desire that is building up inside him, Jake can't let Kari get away. Kari is the sweetest person you'll ever meet. She has a great bond with her mother and brother and she is a loyal and true friend. I really liked the special connection she has with her brother. Because of the fact that I'm also very close to my brother it was easy for me to feel connected to Kari. Kari's heart is broken but she is not letting this define her. Kari is mourning the loss of the man she thought she was going to marry, but she picks up the pieces and shows how strong she actually is. Jake is the dream of every woman on this planet. He is gorgeous, he's great with children and he's a brave fire fighter. I have a soft spot for men in a uniform and I could clearly picture Jake in my head. Jake is also very kind and caring. He loves with all his heart and will never betray anyone. I loved it that Jake and Kari connected in a beautiful way. Fate obviously brought them together. "Fear is an illusion that you can destroy with the power of hope." I absolutely loved this brilliant heartwarming story. 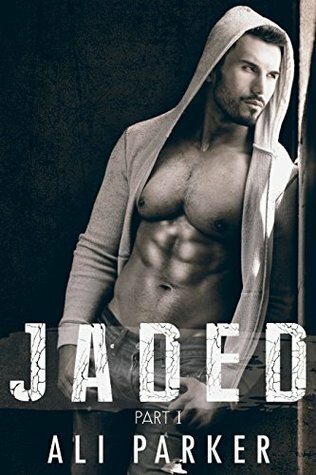 Jaded is free on Amazon, so don't hesitate to get a copy as soon as you can. If you go to Ali Parker's website there's an option to receive another free book. When you sign up for her newsletter you get an exclusive copy of One More Night. I had never heard of this book but I will have to read it. I love these kinds of stories. I love second chance love stories. Thank you for the review. Thank you for your honest review, much appreciated! Great review! Loved the phrase! This looks to be a promising read, with intriguing and multifaceted characters. I've already taken advantage of the sweet and generous freebie offer, and am looking forward to reading this book. Thank you for the heads-up to the freebie, and for introducing me to this author. It's not for me but that phrase is wonderful! I'll share this info with my sister who loves romance! I really want to read this thanks to your review. This is a very powerful quote: "Fear is an illusion that you can destroy with the power of hope."